Whether your business just got a beautiful new flat metal canopy installed or you’ve had the same metal awning for years, keeping it properly maintained is crucial. In order to get the most out of your investment and enjoy your flat metal canopy for years and years, here are some maintenance tips to keep your awning looking brand new. Do it yourself flat metal canopy cleaning is a good option for some businesses, depending on the type of awning and the level of dirt and grime build up. A simple garden hose does the trick for commercial awnings that only have a light level of dirt, but awnings that deal with a greater amount of debris and dirt might need a little extra care. If you have a spray attachment for your hose, use a solution made from three parts water to one part 5% sodium hypochlorite to remove the grime. You can also purchase commercial cleaning solutions like trisodium phosphate and use them in combination with a soft bristled brush to remove dirt that doesn’t come off easily. 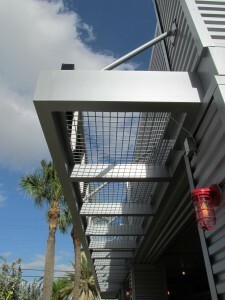 Most business owners opt for a professional cleaning for their flat metal canopies. Professional cleaning services come equipped with the right tools and solutions to clean off any level of dirt, debris, and grime. They can bring expensive equipment like quality pressure washers to make sure the job is done quickly and thoroughly. Cleaning services can also check for any potential pests living in or around your flat metal canopy, like spiders, bees, or birds’ nests. Professional commercial cleaning services can also offer you the additional advantages of time and safety. By leaving the job to a professional, you can focus on running your business instead of getting yourself dirty and having to do it all again in a month. Beyond the time savings, you keep you and your other employees safe by hiring a professional to clean your flat metal canopy. Professionals come equipped with safety equipment, ladders, and procedures designed to minimize risk and stay safe.